Portals themselves are downplayed in favour of traditional, pinball action - made more entertaining thanks to soundbites from GLaDOS and Wheatley - but ultimately this is a rather formulaic table. 'Speedy thing goes in, speedy thing comes out' explains GLaDOS. That's portals for ya. But don't assume you'll need to be 'thinking with portals' while you're playing this pinball game based around the classic Valve title. This isn't Portal-based pinball; this is a Portal-themed pinball table. Yes, you're right, that is less exciting. Not that it should really come as a surprise. Zen Studios' previous themed pinball tables all have their physics and design grounded in the real world and that formula is working nicely. Thankfully, the action here isn't completely grounded in realism. There's a nicely-rendered 3D Chell who makes her way around the perimeter of the playfield by using her portal gun if you complete the correct sequence of shots on the table. There are also a few portals you can actually interact with. The one at the top of the table can be disorientating as your ball is suddenly somewhere else, but it never varies, so you can anticipate its reappearance and hit a skill shot, which feels great. Similarly, the launcher at the start of each round has a skill shot offering half a million points if you can catapult your ball into a portal (moving in sequence) in one shot. These little details and challenges are everywhere and it's rewarding to learn them, especially seeing as success is met with the voice of Stephen Merchant. Indeed, the source material is duly plundered for its best bits. There are plenty of voice clips from the Portal games, with GLaDOS and Wheatley constantly nattering away. The voice clips do repeat pretty quickly, but the repetition surprisingly doesn't get as annoying as it first threatens to be. Atlas and P-Body also make an appearance in one of the game's best moments: a multiball bonus section, complete with absurdly upbeat music and GLaDOS telling you that she isn't impressed with your dancing. The table's evolution is pleasantly complex, with themed tests selectable in any order you like, eventually concluding with a battle against GLaDOS herself. The tests are actually quite difficult despite GLaDOS' protestations that she can't make them any easier, and you'll likely find yourself hitting restart quite often. There's a good pace of discovery as you work out what's required to progress and how to earn extra balls. And the second-by-second opportunities for skill shots mean that there's huge scope for skillful play. For example, nailing the post-teleport side ramp and then switching the light under the exit ramp in time is as tasty a combo as anything in Street Fighter. 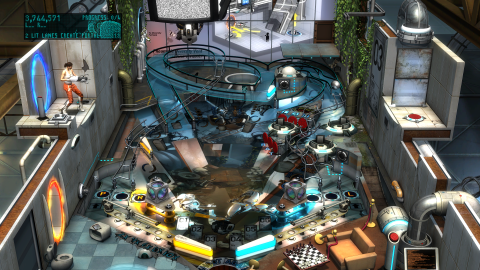 Even so, this certainly isn't the best Pinball FX2 table. It looks rather drab and cluttered thanks to Portal 2's theme of dereliction, and it doesn't feel particularly varied, either, despite the selectable challenges. The background music soon grates (that glorious multiball moment excepted), which makes the action feel more of a slog than it should. The ball's movement is beautifully solid, but it can feel too leaden. You can change the tilt of the table to speed it up, but your scores won't count any more... and high score chasing is the entire point of the game. While pass-the-pad multiplayer and even split-screen competitive 'race to the score' is available, the Xbox Live leaderboards are vital for a game like this, so you'll want your scores to count otherwise it'll soon become a rather hollow experience. For the comparatively tiny price, even if you don't like Portal, this is still a solid pinball table with some funny voice clips. If you are a fan, you'll enjoy it... but it will probably just make you want to play Portal again.